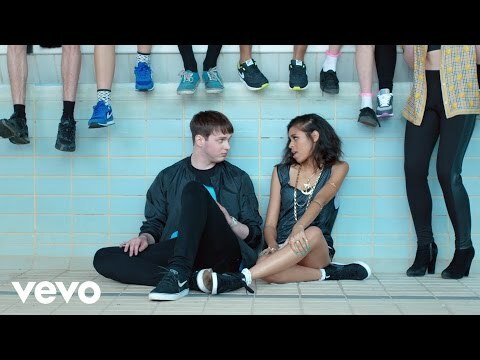 English soul-pop duo AlunaGeorge continues their buzzworthy ascent with the video for their EP’s title track “You Know You Like It.” The video, directed by Believe Media UK’s Sammy Rawal, follows the pair and a teenaged crowd climbing into an abandoned swimming pool for one epic dance party. It’s I Love the 90’s, AlunaGeorge style, with plenty of MTV’s The Grind-era choreography, pool skating and a vibrant mesh wardrobe that would make TLC jealous. Rawal nods to the track’s r+b-inspired rhythms and brings the inner Aaliyah out of singer Aluna George, who grooves with the B-boy crew against the blue backdrop of the empty pool. Since debuting their slinky brand of electro-pop, AlunaGeorge have been crowned the critic’s darlings, solidified with their shortlist honor for the 2013 BRIT Award Critics’ Choice. The visuals for “You Know You Like It” capture their playful old-school style with such effortlessness, it only makes the wait the full-length release “Body Music” on July 29th seem that much longer.